State reported to Congress that it had developed alternative materials to the anti-semitic and pro-incitement PA school curriculum used by UNRWA. In the GAO report, State cannot explain why these existing alternative materials were never implemented and have never been seen in the UNRWA classroom. The GAO report asserts that the PA curriculum used by UNRWA led to participation in riots. Yet the GAO report reveals that State never reviewed nor vetted any PA books used in the UNRWA curriculum. Why did State maintain that there was no incitement in the PA school books? GAO reports that reps of the PA Ministry of Education, who wrote the school books, assured State of such. State relied on these assurances of the PA.
How can UNRWA justify the glorification of murderers in the school books? State tells GAO that “problematic ” pages appear only 3% of the books, which UNRWA acknowledges. If so, why does UNRWA not remove such books ? No explanation. Why does US AID, covering 30% of UNRWA’s budget until recently, never demand the removal of such books? No explanation offered. Senator James Risch (R-Idaho), chair of the US Senate Near East Subcommittee, who initiated the GAO study, is to be commended. He has no real Jewish constituency to speak of. He initially met me for one reason: because of his fundamental integrity. When I showed him chapter and verse of the curriculum, he shook his head and simply said that such incitement to violence has no place in a school system financed in part by the US – let alone by the UN. Senator Risch asked for was “independent verification” of the research that our agency provided for Congress with over the years, ever since we began to acquire the new school books of the PA.
We have received and translated all PA school books used by UNRWA ever since. 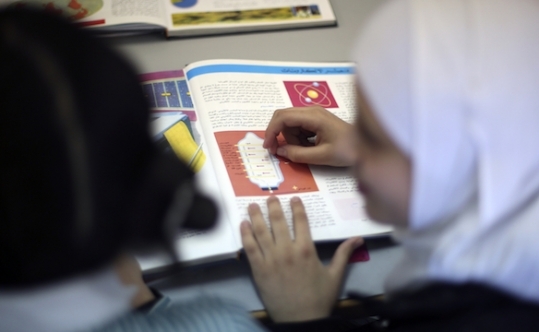 The idea behind the PA issuing its own texts for use in UNRWA schools, was that this would be a sign of an independent Palestinian Arab state in formation. Instead, the theme of the new PA school books evolved iinto the “right of return by force of arms” [ “right of return”- to take back all of Palestine], including what is now Israel. When Senator Risch received the GAO report last April, which provided independent verification that documented that the PA provided a war curriculum for UNRWA, the State Department issued a gag order, not to release the report. Senator Risch had the courage to speak up, telling colleagues that he was shocked that State would classify the report, in order to stop the Congress from even reviewing the GAO study. At one point, a journalist asked the Senator why he does not publish the GAO report on his own. Threat of punishment for violation of classification is stated on what was the opening page of the GAO report before its declassification in early February 2019. Until three weeks ago, spokespeople of the US State Department blamed the GAO for the classification of the report. However, the spokesman of the GAO, Chuck Young, again asserted that the decision to classify the report was made by the State Department. Spokesperson of State was forced to issue a statement that, indeed, only State was responsible. The straw that broke the camel’s back occurred when a State spokeswoman declared that State did not have to respond as to why they classified a report. That response , which produced angry calls from Congress, finally caused State to make the report available for public knowledge and for Congressional scrutiny. The State Dep’t distributed and disclosed the report,with no explanation for the ten month delay. How bad are the PA books used by UNRWA? Archbishop Pietro Sambi, of blessed memory, who served as the Papal Nuncio in 2000, was the first official to review the new PA school books. We have produced more than a dozen short films shot on location in the UNRWA schools, which are have been transformed into paramilitary bases, training children to kill. Had we seen one school book or one school lesson for peace, it would have been an honor to report it. Thanks to the initiative and integrity of Senator James Risch, the issue of UNRWA “education” now see the light of day.